The Cornish Allan Apple – what is its real name? I am looking for advice on the true identity of an apple variety once known and celebrated in West Cornwall: the Allan Apple. It is associated with the festival of Allantide, October 31st – Halloween, of course, elsewhere, and there is now a resurgence of interest in both the feast and the apple variety. There are various legends associated with the Allan Apple, but the one remembered from my childhood was that the Allan Apple was given to young ladies who would put it under their pillow (uneaten!) that night in order to dream of their future sweetheart or lover. The apples are described as large, red and sweetly scented – but no-one nowadays seems to know the variety. My son runs an orchard, and I would love to be able to rediscover this – any suggestions? A ‘Belgian Fence’ of Apples: which varieties? 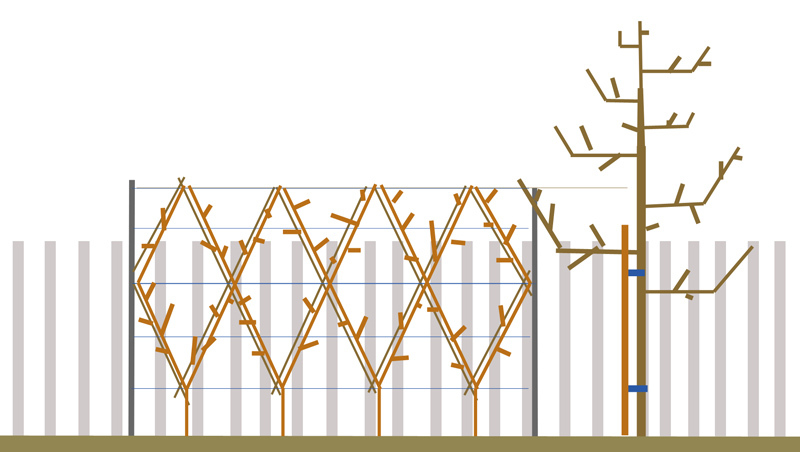 I would like to get some feedback on my plans for a ‘Belgian Fence’ (interwoven double cordon) of apples. I want to create small single intersecting diamond forms as shown in my diagram. After a lot of tastings – I attended three different apple days this year – and getting very interested in some other older varieties that have wonderful flavour – Ashmead’s Kernel, Blenheim Orange, Orleans Reinette – I am close to settling on the varieties above. Three of which are newer improved varieties, and seem like they might be a bit more productive. My space is very limited so I want to maximise productivity (without sacrificing flavour). However I have not managed to taste Scrumptious or Herefordshire Russet – can anyone report on flavour? And productivity or suitability for such restricted training? Situation is a small garden in central London, very sheltered indeed, but probably slightly sub-optimum levels of direct sunlight. Garden is SSE facing with the cordon to run along the left hand fence (running NNW – SSE). The fence is a picket fence around 120cm high so allows some of the early morning direct sunlight through. Then as the sun moves around the row will get direct sunlight from mid-morning to mid-late afternoon. So not full sun all day, but my tomatoes did OK in that position this year, not the best crop I have had, but acceptable. Existing soil is about 18″ to 2ft of clay over building rubble. It is not heavy clay – bit loamy, but has been under paving for many years. I plan to double dig in the next few weeks and add about 25% Veoila soil improver, which I can get from our local tip and seems like good dark stuff – hopefully giving that a month before planting.. I plan to concrete in some angle iron about 8” from the existing fence. Posts to be spaced 2.4m (8ft) apart with galvanised wire and tensioners for support, with canes and ties as generally recommended. Tree spacing 60cm (2ft). Eventual tree height 180cm (6ft). The larger tree on the right in the diagram is to be a Spindle Bush Conference Pear. I am looking at bare-root M9 rootstock from Keeper’s nursery. Apparently due to the warm October the trees are still growing so it is likely to be the New Year before most are lifted. Any experience anyone could bring to bear on any of this would be much appreciated.